Eventually, everyone must admit the truth: they cannot carry something that large. That is why humanity invented the ever-reliable wheel eons ago: to move heavy things. 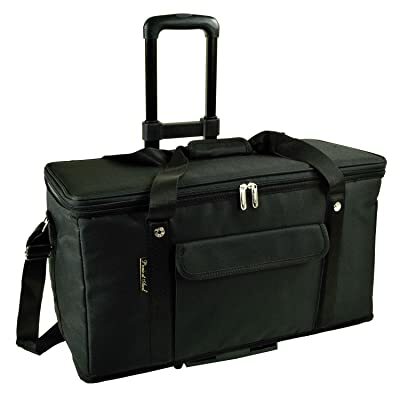 If someone is headed on a big trip and wants to pack enough food, then they will need a big cooler. Luckily, some of the most massive coolers have wheels that come with them. 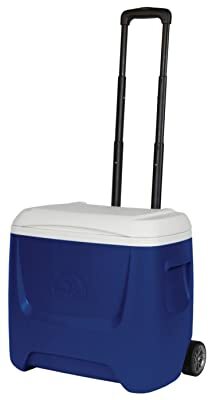 With planning for the summer coming up, here are eight best coolers with wheels for all your needs. Before you start buying, there are a few things that you need to consider so that you can choose the best fit. This is actually pretty important. Having to roll a cooler for extended period’s means, you will have to stay crouched for an extended period. Think of how uncomfortable that will get. Hence, you will want a cooler with a handle that can move out to a comfortable height. Wheel size is as essential to a cooler as it is to a car or truck. The bigger the wheels are, the easier it will be for them to move on rough terrain and off-road. So if someone wants to go somewhere off the beaten path, they will want a more relaxed with the biggest wheels. How big the cooler it can determine where it can go. Having larger handles and wheels is great, but it can also make it harder to store in the car or on a plane. Pay attention to the size as a whole before you choose one. If the product description is right, then the Pelican is the only cooler you will ever need. The people at Pelican created the toughest in mobile cold storage possible. 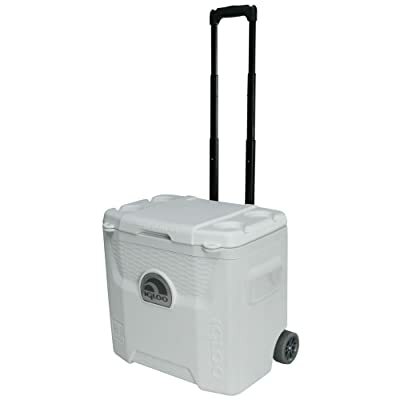 The result was the ProGear Elite Wheeled Cooler. Made from a corrosion resistant stainless steel, the ProGear is built to stand up to the forces of nature. It’s UV resistant, and the various clasps, handles, and locks will keep its cargo secure. Thanks to its 2” insulation, it can stand temperatures up to 90 degrees F and keep everything inside cool. According to Pelican, it can keep doing this for ten days! 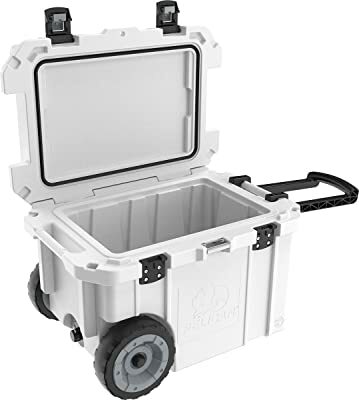 As an added feature, the ProGear cooler is bear-proof. Bears are often drawn to human campsites by the smell of food and the ease to which they can get to it. That can end up being dangerous to everyone. The ProGear, though, is certified by the Interagency Grizzly Bear Committee to be too tough for any bear to pry open. Yogi Bear will give it up! Despite how impressive it looks and is, there are some downsides to this cooler. Unlike other coolers on this list, the ProGear does not have a telescopic handle. This means you have to crouch to pull it along, which can get uncomfortable after a while. Moreover, despite what it says, it may not keep ice for up to ten days at a time. Do not get surprised if the ice melts sooner than expected. Certified to be bear proof! Igloo is well known for their coolers and ice packs, so it is expected for them to be on this list. This is the Igloo Island Breeze 28 Qt. Roller Cooler. It is one of the best roller coolers on Amazon right now. The Island Breeze’s design is straightforward and simple. It has a telescopic handle that can activate via a push locking system. The handle itself can swing up into three different grabs and carry points. For two-handed use, there are side scoop handles to carry it by. The Island Breeze has a curved back, which allows it to be carried if necessary. Underneath the cooler, the elevated bottom minimizes contact with the ground. This protects it from any hot surfaces and improves its cooling abilities as a whole. As for the wheels themselves, the Island Breeze has a pair of soft ride sports wheels, able to handle the most ground. They are not big, but they will get the job done. Since the wheels are small, they will not have to take up much space when the cooler is not in use. All told, the Island Breeze can pack about 29 quarts of food and drinks inside of it. That is thirty-seven cans, twelve 20 oz. drinks, or six two-liter bottles, according to Igloo. That is a lot of room. Just remember that even when it says it works at places like the beach, it may not always do that. One customer said that the wheels do not work well in the sand and that the handle will not work if try to “grip and carry it.” In short, this thing may not handle well on rough terrain. It also has a flaw: no drain spout for melted ice. Move past all that, though, and it is a solid choice. Founded in 1992, Picnic at Ascot Inc. brought Britain’s tradition of stylish picnic baskets to America. From their California HQ, this private, family-owned company has made a medley of products. This, though, is among their best: the Ultimate Travel Cooler with Wheels. This cooler combines the best of both worlds; instead, the best of hard and soft coolers. It is made from a poly canvas fabric with a wire frame sewn in. The built-in supports prevent sagging and water spills when the ice melts. It also has high-density thermal insulation and leak-proof lining. Measuring at 21″ long, 10″ wide x 10″ high, it can handle fifty pounds of weight. At full capacity, it can hold 25 pounds of ice and 32 cans of drinks; twice that without ice. When not in use, it can fold flat as a bathmat for storage. As for the wheels, they are not actually on the cooler. They come in a separate gurney that can be attached to the bottom. The handle can adjust up to 40″ in length, letting people move it along from any position. The one possible downside to this cooler is that cannot keep things cold for long; about 18 hours at best. Other than that, customers have had nothing but praise for this product. Durable yet flexible, combines best of hard and soft coolers. This cooler’s made to be the life of any outdoor party or picnic. 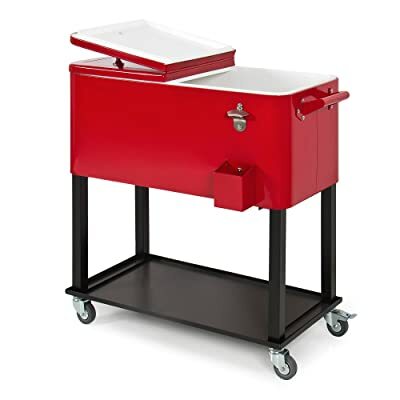 The Best Choice Products Rolling Cooler Cart lives up to its name. It can hold up to eighty quarts of drinks; seventy cans or fifty-plus bottles. Adding to its size is the cart that it is attached to. This brings its dimensions to 15.5″ long, 36”wide and 33″ high. The wheels have two locks to provide stability so that it can move on a patio or deck. This is no simple cooler, though. It comes with a built-in bottle opener, a catch tray, side handles, and an enamel finish. There is an extra tray on the bottom for storing everything else needed. The main downside to this is that it cannot go many places. Even without the cart, it would still be too big to carry around. In addition, its frame does not make it best for the untamed wild or the beach. Other than that, the main concerns are the metal being dented, rusted, or fold in some places. Clearly not meant for rugged outdoors! Another Igloo model, the Marine Ultra Cooler comes in eleven different sizes. They range from 28 quarts to as much as 162 quarts. The only one of them that has wheels, though, is the 28 quart. Built to withstand the water, the Ultra Cooler has strong, rustproof steel screws. The lid strap and hinged latch are also rust-resistant. The 28-quart model also has tie-down hoops, while the lid has four, self-draining cup holders. For movement, it has two non-marking rally wheels. The wheels are soft-ride, so they allow the Ultra Cooler to move fast and easy. Like many wheeled coolers, the handle is telescopic. Adjust it to the desired height, and then lock it into place. To protect it from the sun, the Ultra Cooler has an ultratherm insulation. It keeps the UV rays out and can keep ice frozen up to five days! Despite the advantages, the Ultra Cooler does have a flaw: the lid. While the bottom and sides have insulation, the top does not, despite what they may say. This is important to think about in the end if you want to keep things as fresh as possible. 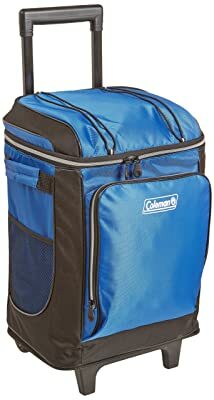 Coleman helps to make fun memories by providing them with all the outdoor gear they could need. From tents to coolers, they have it all. With their Soft Cooler on wheels, people can take their food and drinks into the great outdoors. The removable, hard-plastic liner inside the Coleman’s treated with FDA approved antimicrobials. It will resist mold, fungus, and odor-causing bacteria. When it is cleaning time, take out the liner and then wash it. No need to worry about any leaks. The seams on this cooler are heat-welded, keeping water and ice from seeping out. The inside can hold up to 42 cans at one time, plus the ice; no ice substitutes needed. The handle on this cooler is not the best in the world. Customers have said that it will not lock into place. That means that it will move up and down when moving the cooler. The zipper can also be caught on the lining, but these are minor issues. Keep an eye on it, and it will be fine. 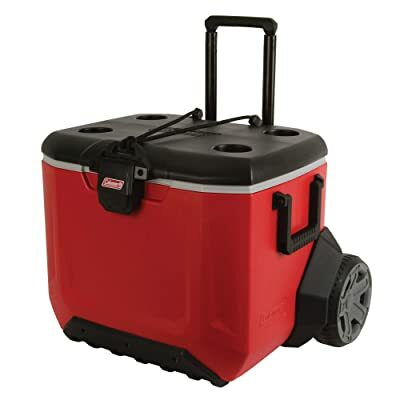 Another model from the ever-reliable Coleman, this Cooler is as rugged as they come. 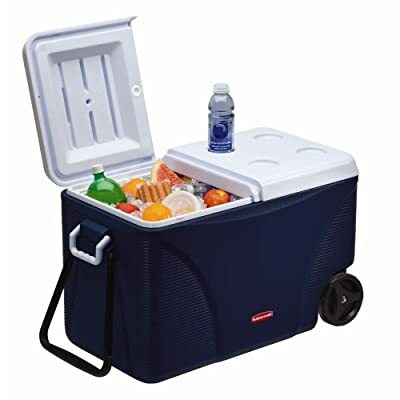 Introducing the Coleman All-Terrain Wheeled Cooler! The big draw to the Coleman to the A/T is the massive, eight-inch wheels. Oversized and heavy-duty, these wheels will make it over any terrain, even when it is full. It also has a locking, telescopic handle that makes for smooth movement and easy storage. If it cannot move by wheels, the EZ-Lift swing lets someone carry it by hand without concerns for pinching. On the inside, it can handle fifty-five quarts or eighty-four cans at once. Thanks to the Keeps the Ice! Insulation built inside, it can keep the insides nice and fresh for up to five days at a time. It can do it even in temperatures as high as 90 degrees Fahrenheit. If extra room is ever needed, the A/T Cooler comes with extra features. The lid has cup holders while including an integrated bungee system that can tie gear to the cover. The cover can stand up to 250 pounds, so it will do fine, and double as a seat. The handle, though, is in an awkward position. Care’s needed not to let it collapse or twist off if the cooler hits a bump. In addition, the bungees can hurt if someone is not careful. Keep that in mind. Bungee system allows for extra packing. Bungees can hurt if not careful. For eighty years, Rubbermaid has represented innovative products to make lives more comfortable. Their products can be found everywhere, and the DuraChill is one of their best on the market! Available in sizes from 45 to 75 quarts, the DuraChill has packed with insulation. It can keep ice nice and cold in 90 degrees Fahrenheit for up to five days. For the 75-quart model, it can keep it cold up to six days. At full capacity, the DuraChill can hold 130 cans, and room for ice, making it great for long trips. The wheels allow this cooler to move across plenty of surfaces. The DuraChill lives up to its name. It is made out of durable metal so that it can handle most kinds of terrains. It has the usual plastic tow handle, can drain liquids, and side swing feels for carrying. The lid even has cup holders that can carry 12-oz and 20-oz bottles. Even though it says, it can keep things fresh for five or six days, do not expect it to always live up to that. Some customers have told it has lasted less time than that. The handle can also end up breaking if not handled with care, so keep an eye on that. Holds 130 cans and have room for ice. It is never fun to have to carry something heavy around. Thanks to the age-old invention of the wheel, we do not have to. 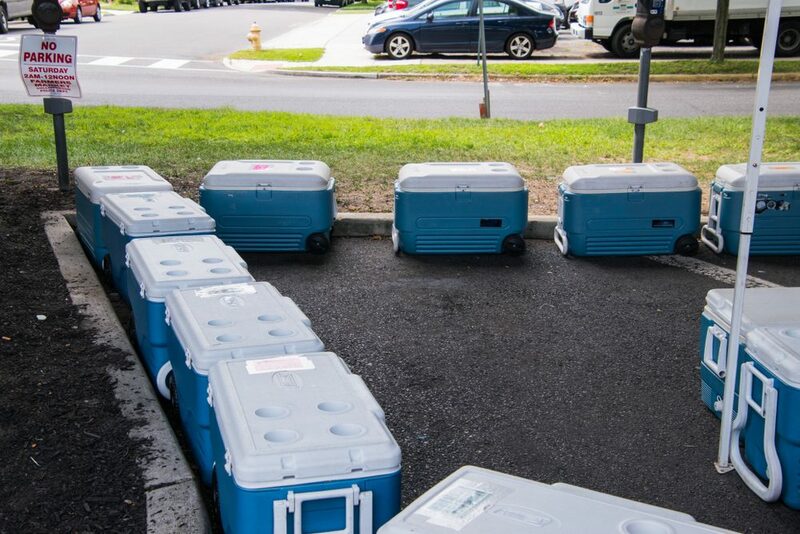 These coolers are as mobile as possible thanks to the inclusion of the wheel, letting them go to new places. 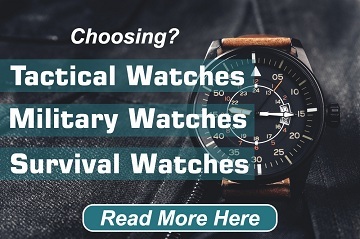 People can take them on long walks without getting tired, making them a big investment. Sometimes, it is better to travel on wheels than on heels!